A drawing style that is used to visualize the conformations of a molecule. The Newman projection is designed to show the confirmations/ different positions of a molecule. 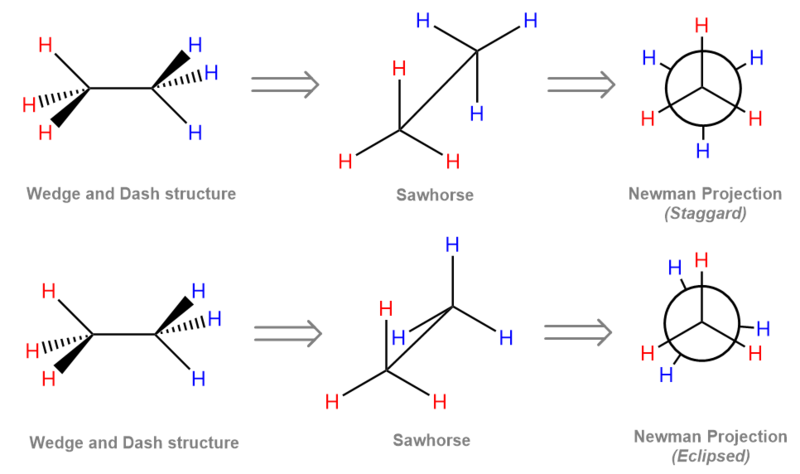 These conformations result from rotation along the C-C single bonds which become bent or twisted. Due to the movement, some confirmations are high in energy while others are low in energy. A molecule, however, always prefers the low strain low energy conformation. The 2 main structures under the Newman projection is the staggered structure and the ellipsed structure. In the staggered structure, the atoms are more evenly spaced out. This reduces repulsion between the atoms and the molecule attains a state of low energy and low strain. In the eclipsed structure, the spacing is not so even and there is a high degree of repulsion between the atoms. This is the high strain high energy state of the molecule. Molecules seldom remain in this state. Example – Drawing the Newman Projection for Ethane.